Scotland's friendly against England has been overshadowed by Republic of Ireland's visit to Celtic Park, according to manager Gordon Strachan. The Irish arrive as European Championship qualifying Group D leaders on 14 November, with England also visiting Glasgow four days later. "Months ago, I would have been talking about tickets for the England game," said Strachan. "It's not that way now. It's all been about the Republic of Ireland." England's trip north follows a 3-2 victory over the Scots in the reverse friendly at Wembley in August 2013. "All the teams in this section have been performing well. There have been some good performances and it is a tough, tough group." "Everybody enjoyed the occasion," said Strachan. "The English people I work with thought it was absolutely fantastic. "They thought it was something different for them and they work on Champions League games. "The players enjoyed it, it's not a friendly and it's something we look forward to. "Unfortunately or fortunately, the Republic game has overshadowed it in a way, which is great as it means there are things going on." Scotland have still to return to the national stadium at Hampden, which had been converted for Commonwealth Games athletics in the summer, and hosted Georgia at Ibrox Stadium in October. 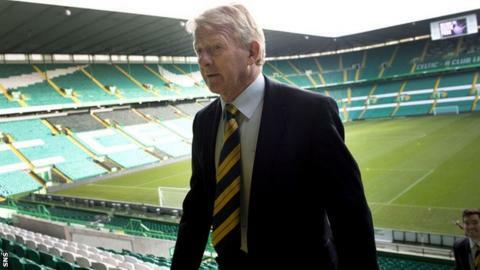 "I think we're all looking forward to the atmosphere," said Strachan as he announced his squad at Celtic Park. "I thought the atmosphere at Ibrox was terrific - that definitely helped us. It is going to be great here as well. "We put in a performance at Ibrox and we're going to put on another one here. "Our performance is helped by our fans and, between us, we can beat anybody." Despite praise for their Group D performances, Scotland sit fourth in the table, three points behind Ireland and Poland and equal with favourites Germany. "We probably think we should have had more points, but if you look at Germany, I think they've had about 80 attempts on goal in three games," stressed Strachan. "They can probably count themselves a bit unlucky. The 14 November game will witness the return of two former Celtic managers, and friends, to the dugout - Strachan and Ireland boss Martin O'Neill. "We've been back to manage an all-star select here in front of 60,000 people," added Strachan. "I am sure, speaking on behalf of Martin as well, we love coming back here. The welcome is terrific."